French for beautiful wardrobe, Belle Armoire marries fabric arts with rubber stamping and embellishments showcasing one-of-a-kind, handmade fashions and wearable-art projects. Whether you're an art stamper, embroidery artist, custom jewelry designer, fabric painter or knitting and crocheting enthusiast, Belle Armoire provides the opportunity and inspiration to create fashions that are uniquely you. 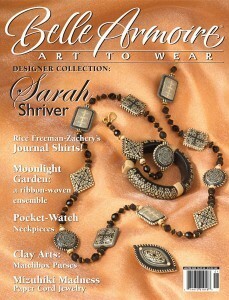 This issue includes clay matchbox purses, button bracelets, the polymer clay jewelry of Sarah Shriver,decorating your shoes to match hand-embellished garments, and more.